Extend the life of your fleet! Your company trucks and delivery vehicles are rolling billboards for your company. 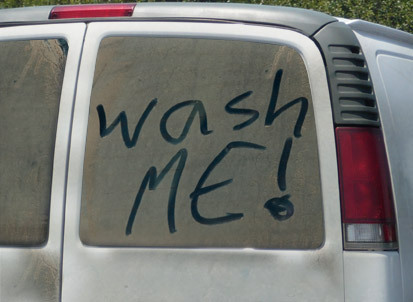 If pranksters can write ‘Wash Me’ in the grime, that’s probably NOT the image you wish to portray! Keep your fleet looking sharp and shiny so customers will easily recognize your clean, shiny vans, trucks, and service vehicles when they arrive in their neighborhood, or see them out on the road. Regular car cleaning maintenance also protects your monetary investment, and reduces the risk of mechanical problems. Contact Clean Planet Car Wash to put together a Fleet Cleaning Plan for your business! • Get A Free Car Wash!